Christine Margarethe Prinzessin von Hessen-Kassel was born on 10 January 1933.1 She was the daughter of Christoph Ernst August Prinz Major von Hessen-Kassel and Sophia zu Schleswig-Holstein-Sonderburg-Glücksburg, Princess of Greece and Denmark.1 She married, firstly, Andrej Karageorgievich, Prince of Yugoslavia, son of Alexander I Karageorgievich, King of Yugoslavia and Marie von Hohenzollern-Sigmaringen, Princess of Romania, on 1 August 1956 in a civil marriage, They were remarried the following day in a religious ceremony.1 She and Andrej Karageorgievich, Prince of Yugoslavia were divorced in 1962.1 She married, secondly, Robert Floris van Eyck, son of Pieter Nicolaus van Eyck and Nelly Estelle Benjamins, on 3 December 1962 at London, EnglandG.1 She and Robert Floris van Eyck were divorced on 15 December 1985 at London, EnglandG.1 She died on 21 November 2011 at age 78 at Gersau, Switzerland. From 3 December 1962, her married name became van Eyck. Tatiana Maria Karageorgievich, Princess of Yugoslavia was born on 18 July 1957 at London, EnglandG.2 She is the daughter of Andrej Karageorgievich, Prince of Yugoslavia and Christine Margarethe Prinzessin von Hessen-Kassel. She married Gregory Thune-Larsen on 30 June 1990. She gained the title of Princess Tatiana Maria of Yugoslavia.2 From 30 June 1990, her married name became Thune-Larsen. Christopher Karageorgievich, Prince of Yugoslavia was born on 4 February 1960 at London, EnglandG.2 He was the son of Andrej Karageorgievich, Prince of Yugoslavia and Christine Margarethe Prinzessin von Hessen-Kassel. He died on 14 May 1994 at age 34, killed in a road accident. He gained the title of Princess Christopher of Yugoslavia.2 Christopher Karageorgievich, Prince of Yugoslavia also went by the nick-name of Marko. Karl Wladimir Cyril Andrej Karageorgievich, Prince of Yugoslavia was born on 11 March 1964 at London, EnglandG.1 He is the son of Andrej Karageorgievich, Prince of Yugoslavia and Kira Melita Feodora Marie Viktoria Alexandra Prinzessin zu Leiningen. He was also reported to have been born on 21 March 1964 at London, EnglandG. Dimitri Ivan Mihailo Karageorgievich, Prince of Yugoslavia was born on 21 April 1965 at London, EnglandG.1 He was also reported to have been born on 12 April 1965. He is the son of Andrej Karageorgievich, Prince of Yugoslavia and Kira Melita Feodora Marie Viktoria Alexandra Prinzessin zu Leiningen. [S22] Sir Bernard Burke, C.B. LL.D., A Genealogical History of the Dormant, Abeyant, Forfeited, and Extinct Peerages of the British Empire, new edition (1883; reprint, Baltimore, Maryland: Genealogical Publishing Company, 1978), page 417. Hereinafter cited as Burkes Extinct Peerage. 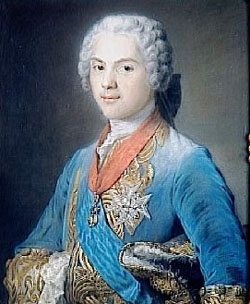 Louis Ferdinand de Bourbon, Dauphin de France was born on 4 September 1729 at Versailles, Île-de-France, FranceG.4 He was the son of Louis XV, Roi de France and Marie Charlotte Sophie Leszczynska, Princess of Poland.4 He married, firstly, Maria Teresa Antonietta Rafael de Borbón, Infanta de España, daughter of Felipe V de Borbón, Rey de España and Isabella Elizabeth Farnese, on 23 February 1745 at Versailles, Île-de-France, FranceG.5 He married, secondly, Marie Josephe Prinzessin von Sachsen, daughter of Friedrich August II von Sachsen, King of Poland and Maria Josepha Erzherzogin von Österreich, on 9 February 1747 at Versailles, Île-de-France, FranceG.4 He married Maria Teresa Antonietta Rafael de Borbón, Infanta de España, daughter of Felipe V de Borbón, Rey de España and Isabella Elizabeth Farnese, on 18 December 1744 at Madrid, SpainG, in a proxy marriage.5 He married Marie Josephe Prinzessin von Sachsen, daughter of Friedrich August II von Sachsen, King of Poland and Maria Josepha Erzherzogin von Österreich, on 10 January 1747 at Dresden, Sachsen, GermanyG, in a proxy marriage.5 He died on 20 December 1765 at age 36.4 He was buried at Sens CathedralG. She gained the title of Prinzessin von Thurn und Taxis. Her marriage to Franz Joseph Prinz von Hohenzollern-Sigmaringen was annulled on 7 December 1954. [S12] C. Arnold McNaughton, The Book of Kings: A Royal Genealogy, in 3 volumes (London, U.K.: Garnstone Press, 1973), volume 1, page 84. Hereinafter cited as The Book of Kings.